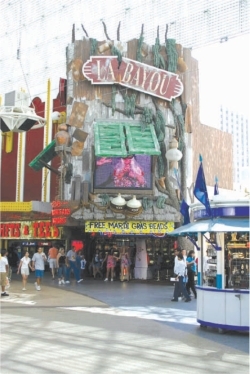 Originally called the ‘Northern Club’, La Bayou is the first Casino and resort in Vegas. Never been to Las Vegas? We were often confronted with this awkward question as we prepared ourselves for a short trip to the man-made wonderland. Politely we enquired-have you been there and how was it? The answer we got was usually 'many times' and 'beyond description'. We were also informed that Las Vegas was a land where some dreams are realised and others are broken. So, it was with a lot of hope and expectations that we landed at the Las Vegas' McCarran International airport-a grand affair in the middle of a desert surrounded by low grayish mountains with occasional rust-coloured patches. It was the end of July and our three sons, who had visited Vegas, had warned that we had chosen the wrong time for our trip. Vegas has a sub-tropical desert climate-June to September are very hot and mostly dry, with average day-time temperature of 94 to 104 degree Fahrenheit. Truly, as soon as we landed and started looking for a taxi to our hotel, we experienced a good scorching by the intense heat even at five in the afternoon. It felt as if we had entered an oven but the heat was dry and somewhat manageable. It rains only a few days in Vegas but we were fortunate in having one such shower during our short stay and the weather thereafter was milder than usual. Our hotel was close to the mile-long stretch on the Las Vegas Boulevard commonly known as the 'strip' where most of the famous and gigantic hotels and Casinos are located. These hotels are self-sufficient in catering to the tourists' main interest-euphemistically called gaming and entertaining shows, quality shopping and fine food. Activities in this city go on twenty-four hours to which millions of visitors are drawn from all over the world and the United States every year. People move around from casino to casino, various world-class shows and restaurants in various hotels day and night. The glitter of the abundant lights and neon signs in the strip are spectacular and dazzling. People there appear so carefree and opulent that one feels as if the world is full of milk and honey and there is no pain and suffering anywhere. Though it appears to be a rich and fortunate man's paradise, there is high unemployment and some poverty in the area. In the 19th century, when the Spaniards first went to the Las Vegas Valley area- then part of Mexico, it had many artesian wells, which supported green areas or meadows. Las Vegas derived its name from 'the meadows' (Las Vegas in Spanish.) The growth of the city began in 1931 with the opening of the Northern Club (now the La Bayou), the first casino and resort in Vegas. The Golden Nugget Hotel and Casino, which we visited, is a big hotel in the downtown area at the northern end of the Las Vegas Boulevard. Gradually, Vegas became popular with tourists from all over the world. The uniquely covered pedestrian-only Freemont Street in downtown with many shops, casinos and restaurants was quite interesting. It appeared to me to be covered by light-coloured metal strips with gaps, which protects from the sun but does not fully protect from rain. This area is outside the 'strip'-now the main attraction of Vegas. In the nineties, efforts were made by the city authorities to revive the downtown but with the opening of the Mirage in 1989, resort development moved to the southern portion of the Las Vegas Boulevard. Some of the most popular hotels like the Bellagio, Caesar's Palace, Flamingo, Luxor and Mandalay Bay were opened there on a grand scale in the last twenty years. Bellagio's playful fountains, both outside the hotel and inside in the indoor, garden area under a dome, are most pleasant. Its garden has thousands of species of plants and colourful flowers, as well as a replica of the Philadelphia Liberty Bell. 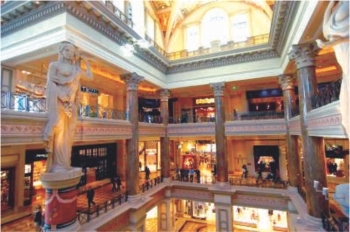 Next door, the Caesar's Palace is built in a Roman style with many statues of famous Roman figures. We found people dressed in period costumes representing Caesar and Cleopatra moving around the hotel's vast corridors. The Palazzo and the Venetian Hotels on the other side of the Boulevard are inter-connected. Part of the latter hotel looks like little Venice, with canals, bridges and Gondola rides in the canals. Even the St Marco's square with its historic buildings and architecture is reproduced here and of course there were a few Italian restaurants. The entire area is artificially covered by a soothing light- blue sky, giving an appearance and feeling of cool early evening, even when it was noon time outside with 100 degree temperature. Elsewhere on the strip, we found replicas of famous Paris landmarks-the Eiffel Tower and the Arc de Triomphe. Our budget for playing at the casinos was quite limited. Also, our experience was no match to our companion, Abul Siddique. He had developed his skills at the Black Jack and roulette tables by numerous visits to the nearby Atlantic City casinos in New Jersey, where he had frequent winning streaks. This was his third visit to Vegas. Being a Yale PhD, his knowledge of mathematics and economics might have been a great advantage to him. He was able to somewhat maintain his winning record during this visit. We mainly confined ourselves to pulling the levers of the slot machines. Many of the machines had, however, buttons to press to spin the wheels. Our net result was dismal. A few times, I tried roulette, fortunately with modestly good results-may be a beginner's luck. Irrespective of the loss or gain, it was a lot of fun indulging a little at the games. World-class shows are a regular feature at the many hotels, which also help attract many visitors. One has to book the seats, which are quite expensive, months in advance to get in at the right time and day. We reserved two such- the Celine Dion concert at the Caesar's Palace Hotel and the Cirque de Soleil, a spectacular circus and entertainment show at the Bellagio. These halls are gigantic in size-seating about 1500 people in each show. Celine has been our favourite singer for a long time but we had seen her only on the TV. This was, thus, a wonderful opportunity to see her in person and hear songs in her inimitable style and soaring voice. A music legend, she is an import from Canada. At many parts of Vegas, huge boards were put up showing Celine's waist-up bare back with the slogan “Celine's back”. The pun was intended since Celine, a regular feature of Vegas, had returned this season after an absence of two years during which she had twins. An additional bonus of the show was the guest appearance of a great singer and song-writer, Stevie Wonder-a blind man since his childhood, who sang one of his hit songs while playing on the piano with a big smile, as usual, on his face. At the Cirque du Soleil, we were seated at the second row, and often splashed with water during some of the acrobatics. The music accompanying the magnificent and often dangerous acrobatic and athletic feats was happy and melancholy at the same time. The show had to be adjourned by 15 minutes due to an injury suffered by one of the artists who required to be taken to the hospital. The costumes were vibrant and the stage techniques were marvelous. We wondered how they created a large pool of water- about 75 feet wide and 35 feet deep in a 30-ton structure in the stage inside a hotel. Truly, the efforts we made and the expenses were worth the two memorable shows. People also go to Vegas for fine dining and shopping experiences. There are first class restaurants catering to various tastes and presenting different cuisine. The Mesa Grill and Guy Savoy were highly recommended by friends and relations. We had dinner at the latter restaurant and the superb French cooking and fine ambience lived up to its excellent reputation. Reputed, upscale shops like the Channel, Bally and Rolex were all represented at the hotels to cater to the rich tourists. We were quite content with buying for our grandchildren souvenirs, T shirts and toys reflecting the local scene and returning to our regular surroundings in Washington with memories of a trip to a dazzling and unreal world.